Enhancing outdoor living areas has become a huge part of my business in recent years with over 80% of the enquiries I receive including some kind of outdoor renovation or design so I have compiled a list on the easiest ways you can increase and add value to your home, while expanding your usable living areas to make the most of the dry season. Add a covered pergola, garden screens to separate areas, or arches with climbing plants emphasise features in your garden – This is a simple way to increase drama and elevate a boring area to something spectacular and unique. There are lots of laser cut screens available to choose from in all weather materials. 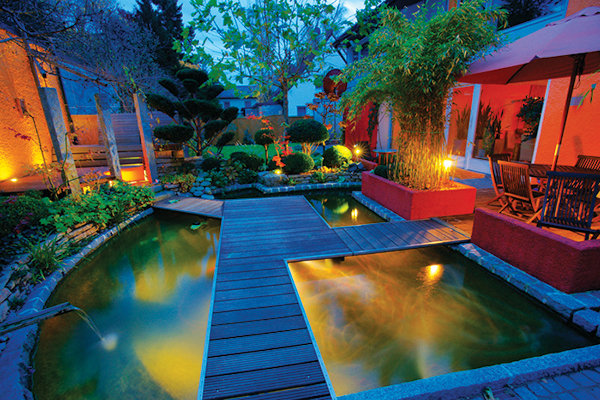 Landscape lighting – Use lighting to feature your flora and fauna- a spotlight directed up into the foliage of a beautiful tree, lanterns mixed in amongst ferns, fairy lights strung across a pond or water feature or illuminate a piece of art with solar lights. Garden sculptures or bird baths – By putting something sculptural or unique or in our gardens we add an unexpected element of whimsy and a resting place for your eyes. Garden murals- Either painted murals or mosaics are the easiest way to brighten up a large space, We have so many local artists in the NT there is no excuse to not have a unique piece of artwork in amongst your greenery. Edible gardens – Gone are the days of foam boxed veggie gardens – these days you can create vertical green walls using hanging pots and wall mounted systems or tables with built in planters in the centre so that you can pick your own salad leaves or herb while sitting down to a bbq. There is also a growing trend towards having less hard scaping areas (such as lots of concreting, paving or built in furniture) with a move towards more natural planting styles, more open garden beds with an increased focus on more decking surrounded by green areas which naturally cools your entertaining area at the same time.